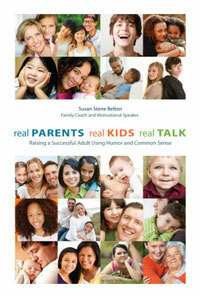 Family coach and motivational speaker Susan Stone Belton dispels many of the common myths of parenting. It is the parent’s job to try to come up with creative solutions to family issues. But parents cannot know every answer to every problem. There is nothing wrong with asking professionals, friends, and family members for ideas and assistance. It is a sign of strength to admit, “I am not sure of the answer. Let’s ask for help.” And please remember another — and very important — source of outside help: Your children. Asking your children for advice could result in some good ideas. Say to your child, “I am feeling frustrated that you have not been a good listener lately, and I have been yelling to get you to pay attention. I don’t want to keep yelling, so what else can we do together to solve this problem?” You just might be surprised by your child’s creative answers! It is the parent’s job to instill discipline in their children, to teach them the polite way to behave in every situation, and how to manage their own emotions. But parents cannot control everything their children do. Good parenting includes allowing children to make some of their own choices, and then allowing the child to experience the negative consequences of those choices. When deciding whether or not to allow your child to make a choice, ask yourself, “What is the worst that can happen?” If it is not a matter of health and safety, and you can live with the negative consequence, then so can your child. Children are going to misbehave and make poor choices occasionally. So instead of being upset or angry, simply look at it as a valuable teaching experience. It is reasonable to accept that parenting includes stress, arguing, sibling rivalry and challenging decisions. But in too many families, this seems to be the rule, and not the exception. As parents, our job is to reduce the level of tension, and not to accelerate it. We can do that by remaining calm, by not yelling, and by discussing the challenges, not ignoring them. Our children will act the way we do, and so use stressful situations as an opportunity to teach your child how to act. Every family has an occasional raised voice, difficult moment, or unhappy situation. Teach your children, through your actions, that more can be accomplished by being calm and polite than by yelling and arguing. It is hard work; the most challenging and difficult job there is. But it is also a lot of fun. Children at every age are funny, creative, interesting, cute and fun to be with. Being with children gives us the opportunity to go down a slide, use play dough, and laugh at a silly cartoon. Being silly and laughing with our children makes them feel close to us, makes them want to spend time with us, and makes them feel comfortable with us. It tells our children that we are people too, and that we can be close and open with each other. At the same time, children do not need us to be their friend. Our children have lots of friends — but only one mom and dad. So remain in the parent role — but be a friendly parent. Laugh with your kids, love your kids, and enjoy every moment of this amazing journey.